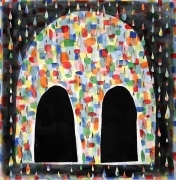 James Cohan Gallery is proud to present the fourth gallery exhibition by artist Trenton Doyle Hancock. 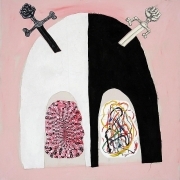 Hancock is well known for evolving his absurdist narrative of the battle between good and evil executed across a wide variety of media that includes painting, collage, sculpture, print and the performing arts. 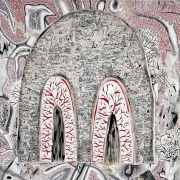 The artist's densely layered works incorporate text, drawing, collaged paper, plastic, felt, fur and paint to create a collision of symbols and visual tropes that evidence Hancock's singular vision and distinctive means of storytelling. 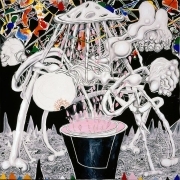 In this new body of work, which includes paintings, wall drawings and prints, Hancock continues a retelling of his sprawling, epic battle between the forces of good, as represented by Mounds and their color-filled world, and evil, as embodied by the skeletal Vegans who live underground in a world of black and white. Peaceful creatures, Mounds survive on Mound Meat, a pink substance that once ingested allows all to experience a life of color. At the center of Hancock's tale are two pivotal characters: Vegan leader, Betto Watchow, and enlightened Vegan prophet, St. Sesom, who introduces Vegans to the world of color. Betto views Sesom's proselytizing as traitorous and fears his increasing power. In reaction, Betto launches an all out war against Sesom, his disciples, and the Mounds. 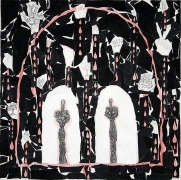 The main gallery will feature the centerpiece of Hancock's show, a grid-like arrangement of eight five-foot-square canvases installed on a wall painting that references the underworld battleground. These austere works depict Color Babies and Darkness Babies, which Sesom and Betto have enlisted separately as their militia. 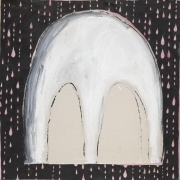 In the title painting, Fear, a Baby, recognizable by its large egg-shaped head, looms just above the horizon as the black background is showered in pink Mound Meat, suggestive of slaughtered Mounds. 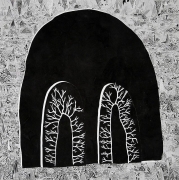 The seven other works in this series each illustrate a Baby head amidst the Vegan landscape, lined up as if marching off to battle. 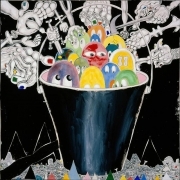 In the eight-by-eight foot painting, Descension and Dissension, Sesom is portrayed using his telepathic powers to generate color, showering the Vegan world with prismatic rays, while in the seven-by-nine-foot painting The Bad Promise, Betto juts his bony black arm across the canvas, reaching his hand beneath a fellow Vegan's head oozing with Mound Meat. 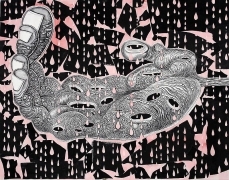 The exhibition will also feature a new portfolio of twenty mixed-media prints, entitled Fix, which the artist recently completed at the Brodsky Center for Innovative Editions, Rutgers University. 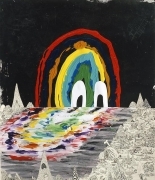 The print series further evidences the influence of many artists upon Hancock's work, including R. Crumb, Henry Darger, Lee Baxter Davis, Max Ernst, Philip Guston and Gary Panter, as well as the impact of the artist's evangelical Christian upbringing and his insatiable appetite for contemporary art and culture. 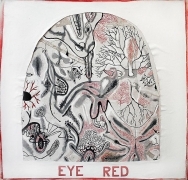 Trenton Doyle Hancock is the 2007 Joyce Alexander Wein award winner from The Studio Museum, NY. 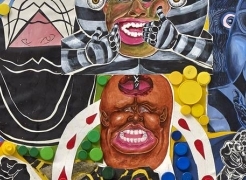 His work is exhibitionsly in the exhibitions In the Beginning: Artists Respond to Genesis at the Contemporary Jewish Art Museum, San Francisco, CA, and was recently part of the Dargerism: Contemporary Artists and Henry Darger at the American Folk Art Museum, NY. 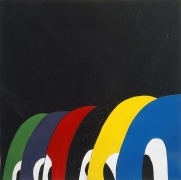 He is included in the Prospect.1 New Orleans Biennial and in 2009 will produce a site-specific installation at the Olympic Sculpture Park at the Seattle Art Museum, WA. In April 2008, Hancock provided the costume and set design for Cult of Color: Call to Color, a collaboration with choreographer Stephen Mills and composer Graham Reynolds for the Austin Ballet, TX. In 2007, the Fruitmarket Gallery, Edinburgh, hosted Hancock's major European solo show, The Wayward Thinker, which traveled to the Museum Boijmans Van Beuningen, Rotterdam. 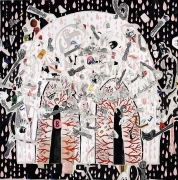 Hancock was one of the youngest artists ever to be included in the Whitney Biennial, in both 2000 and 2002. Born in Paris, Texas, Hancock exhibitionsly lives and works in Houston. 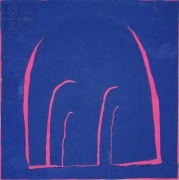 Hancock's work is included in the collections of the Brooklyn Museum, NY; The Dallas Museum of Art, TX; The Modern Art Museum of Forth Worth, TX; Museum Boijmans Van Beuningen, Rotterdam, The Netherlands; The Museum of Modern Art, NY; Metropolitan Museum of Art, NY; Whitney Museum of American Art, NY; The Studio Museum in Harlem, NY; San Francisco Museum of Modern Art, CA; and Museo di arte moderna e contemporanea, Trento, Italy. 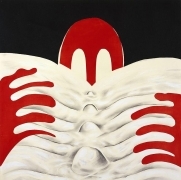 Please also join us for a special talk with the artist Friday, November 21st at 6:30pm.